I love the crispy, sweet and sour taste of these summer Pickled Red Onions. They are very easy to make and a great addition to any meal. They do not only add great flavour, a beautiful freshness and spiciness, but they also help support digestion. I often have a hard time digesting raw onions. It often upsets my stomach and makes me feel bloated. 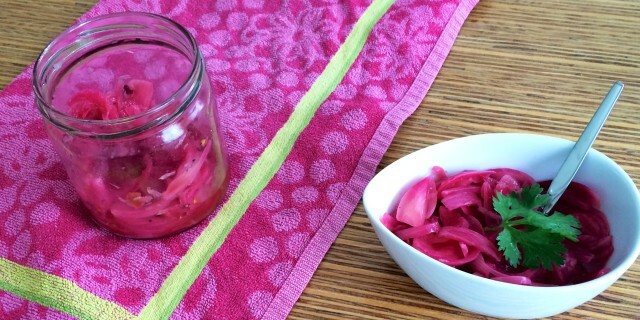 Pickled Red Onions are a great way to enjoy onions without any digestive upset. Due to the process of fermentation, pickled onions contain beneficial enzymes and bacteria that aid digestion and support overall health. When you add more probiotic-rich foods to your diet, this will dramatically improve your gut health. Simply enjoying a small amount of pickles with a meal will help you to digest your food more easily. It will also help you to absorb more nutrients from your meal. I like to add pickles to many dishes, from fried rice to bean dishes and salads. Bring water up to a boil in a small sauce pan. Take off heat and add onion rings to a small sauce pan. Soak the onion rings for 10 minutes to soften. Remove and drain the onion rings and add them to a small bowl or mason jar. Add the lime juice, crushed chili, coconut sugar and season with freshly ground black pepper and sea salt. Cover the bowl or mason jar and allow the onions to marinate for 2 or 3 hours so all the flavours blend and intensify. Serve with fresh tacos or tortillas, a salad, bean dishes or fried rice. You can store the pickles in an air-tight container in the refrigerator for up to 3 days. One Response to "Pickled Red Onions"